Carotid artery dissection begins as a tear in one of the carotid arteries of the neck, which allows blood under arterial pressure to enter the wall of the artery and split its layers. The result is either an intramural hematoma or an aneurysmal dilatation, either of which can be a source of microemboli, with the latter also causing a mass effect on surrounding structures. Carotid artery dissection is a significant cause of ischemic stroke in all age groups, but it occurs most frequently in the fifth decade of life and accounts for a much larger percentage of strokes in young patients. Dissection of the internal carotid artery can occur intracranially or extracranially, with the latter being more frequent. Internal carotid artery dissection can be caused by major or minor trauma, or it can be spontaneous, in which case, genetic, familial, or heritable disorders are likely etiologies. Once diagnosed and treated, patients with carotid artery dissection require regular follow-up and imaging studies of both carotid arteries. Healing usually takes 3-6 months, and the incidence of contralateral dissection is higher in these patients than in the general population. When the condition is diagnosed early, the prognosis is usually good. A high index of suspicion is required to make this difficult diagnosis. For patient education resources, see the Brain & Nervous System Center, as well as Worst Headache of Your Life, Transient Ischemic Attack (TIA, Mini-Stroke), and Stroke. Arterial dissection. (A) Tear and elevation of intima from wall of artery, resulting in luminal stenosis. Illustration shows stasis of flow in false lumen beneath elevated intima. This condition creates blind pouch that predisposes patient to thrombus formation. (B) Subadventitial dissection represents hemorrhage between media and adventitia. Artery may become dilated as result of thickening of arterial wall, with some degree of luminal narrowing. Elevation of intimal flap is not commonly associated with this type of dissection. Hemorrhage may extravasate through adventitia, resulting in pseudoaneurysm or fistula formation. Sometimes, the dissection plane lies between the tunica media and the tunica adventitia, resulting in an aneurysmal outpouching of the arterial wall that may also become a source of distal emboli. Aneurysmal dilatation can also cause a mass effect on nearby structures such as sympathetic fibers and the lower cranial nerves. [1, 2] The dilatation resulting from an internal carotid artery dissection may be termed a true rather than a false aneurysm because the wall is composed of blood vessel elements. The annual incidence of symptomatic spontaneous internal carotid artery dissection is 2.5-3 per 100,000. The incidence of carotid artery dissection as a result of blunt injuries (mainly high-speed motor vehicle accidents) ranges from less than 1% to 3%. The actual incidence may be higher; some dissections are asymptomatic or cause only minor transient symptoms and remain undiagnosed. Internal carotid artery dissection is a common cause of ischemic stroke in patients younger than 50 years and accounts for as many as 25% of ischemic strokes in young and middle-aged patients. The mean age for ischemic stroke secondary to internal carotid artery dissection from blunt traumatic injury is even younger: 35-38 years. Dissection of the intracranial part of the internal carotid artery is rare at any age, because the intracranial carotid artery is less mobile and the skull absorbs most of the force of trauma. No significant gender-based difference in frequency exists for spontaneous internal carotid artery dissection, though there may be a slight male preponderance when traumatic causes of carotid artery dissection are taken into account. In general, the prognosis depends on the severity of the initial ischemic injury and the extent of collateral circulation. Overall, the prognosis for spontaneous internal carotid artery dissection is favorable, with about 75% of patients making a good recovery. [1, 9] The reported mortality is less than 5%. Patients who have a dissection secondary to trauma have a much higher mortality on discharge. As with other causes of stroke in young adults, the functional outcome is generally good, and recurrence of cerebral ischemia and carotid artery dissection is rare. The risk of recurrence is highest in the first month and then remains in the area of 1% per year for about a decade. Headache may persist, in some cases for years after the dissection. Schievink WI. Spontaneous dissection of the carotid and vertebral arteries. N Engl J Med. 2001 Mar 22. 344(12):898-906. [Medline]. Redekop GJ. Extracranial carotid and vertebral artery dissection: a review. Can J Neurol Sci. 2008 May. 35(2):146-52. [Medline]. Goyal MS, Derdeyn CP. The diagnosis and management of supraaortic arterial dissections. Curr Opin Neurol. 2009 Feb. 22(1):80-9. [Medline]. Shankar Kikkeri N, Nagarajan E, Sakuru RC, Bollu PC. Horner syndrome due to spontaneous internal carotid artery dissection. Cureus. 2018 Sep 28. 10(9):e3382. [Medline]. [Full Text]. Cothren CC, Moore EE, Biffl WL, et al. 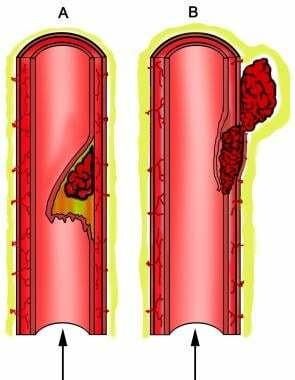 Anticoagulation is the gold standard therapy for blunt carotid injuries to reduce stroke rate. Arch Surg. 2004 May. 139(5):540-5; discussion 545-6. [Medline]. Ohshima T, Miyachi S, Isaji T, Matsuo N, Kawaguchi R, Takayasu M. Bilateral vertebral artery dissection and unilateral carotid artery dissection in case of Ehlers-Danlos syndrome type IV. World Neurosurg. 2019 Jan. 121:83-7. [Medline]. Debette S, Leys D. Cervical-artery dissections: predisposing factors, diagnosis, and outcome. Lancet Neurol. 2009 Jul. 8(7):668-78. [Medline]. Baker WE, Wassermann J. Unsuspected vascular trauma: blunt arterial injuries. Emerg Med Clin North Am. 2004 Nov. 22(4):1081-98. [Medline]. Baumgartner RW. Management of spontaneous dissection of the cervical carotid artery. Acta Neurochir Suppl. 2010. 107:57-61. [Medline]. Arthurs ZM, Starnes BW. Blunt carotid and vertebral artery injuries. Injury. 2008 Nov. 39(11):1232-41. [Medline]. Chen SY, Zipfel GJ, Wick CC. Internal carotid artery dissection causing pulsatile tinnitus. Am J Otolaryngol. 2019 Jan - Feb. 40 (1):121-3. [Medline]. Tobin J, Flitman S. Cluster-like headaches associated with internal carotid artery dissection responsive to verapamil. Headache. 2008 Mar. 48(3):461-6. [Medline]. Divjak I, Slankamenac P, Jovicevic M, Zikic TR, Prokin AL, Jovanovic A. A case series of 22 patients with internal carotid artery dissection. Med Pregl. 2011 Nov-Dec. 64(11-12):575-8. [Medline]. Patel RR, Adam R, Maldjian C, Lincoln CM, Yuen A, Arneja A. Cervical carotid artery dissection: current review of diagnosis and treatment. Cardiol Rev. 2012 May-Jun. 20(3):145-52. [Medline]. Flis CM, Jager HR, Sidhu PS. Carotid and vertebral artery dissections: clinical aspects, imaging features and endovascular treatment. Eur Radiol. 2007 Mar. 17(3):820-34. [Medline]. Caplan LR. Dissections of brain-supplying arteries. Nat Clin Pract Neurol. 2008 Jan. 4(1):34-42. [Medline]. Kim YK, Schulman S. Cervical artery dissection: pathology, epidemiology and management. Thromb Res. 2009 Apr. 123(6):810-21. [Medline]. Arnold M, Baumgartner RW, Stapf C, et al. Ultrasound diagnosis of spontaneous carotid dissection with isolated Horner syndrome. Stroke. 2008 Jan. 39(1):82-6. [Medline]. [Full Text]. Heldner MR, Nedelcheva M, Yan X, et al. Dynamic changes of intramural hematoma in patients with acute spontaneous internal carotid artery dissection. Int J Stroke. 2015 Aug. 10(6):887-92. [Medline]. Xianjun H, Zhiming Z. A systematic review of endovascular management of internal carotid artery dissections. Interv Neurol. 2013 Sep. 1(3-4):164-70. [Medline]. [Full Text]. Fava M, Meneses L, Loyola S, et al. Carotid artery dissection: endovascular treatment. Report of 12 patients. Catheter Cardiovasc Interv. 2008 Apr 1. 71(5):694-700. [Medline]. Zhou Y, Yang PF, Hong B, et al. Stent placement for the treatment of complex internal carotid bifurcation aneurysms: a review of 16 cases. Turk Neurosurg. 2013. 23(2):232-40. [Medline]. Juszkat R, Liebert W, Stanisławska K, et al. Extracranial internal carotid artery dissection treated with self-expandable stents: a single-centre experience. Cardiovasc Intervent Radiol. 2015 Dec. 38(6):1451-7. [Medline]. Donnelly A, Sinnott B, Boyle R, Rennie I. Beware the middle-aged migraine: internal carotid artery dissection mimicking migraine in the emergency department. BMJ Case Rep. 2017 Nov 28. 2017:[Medline]. [Full Text]. Esianor BI, Haider AS, Engelhardt MI, et al. Intracranial ischemic infarct due to blunt force trauma in a high school football player. Cureus. 2017 Sep 7. 9(9):e1659. [Medline]. Paraskevas KI, Batchelder AJ, Naylor AR. Fate of distal false aneurysms complicating internal carotid artery dissection: a systematic review. Eur J Vasc Endovasc Surg. 2016 Sep. 52(3):281-6. [Medline]. [Full Text]. Induruwa I, Bentham C, Khadjooi K, Sharma N. Computed tomography perfusion can guide endovascular therapy in bilateral carotid artery dissection. Eur J Case Rep Intern Med. 2016. 3(1):000295. [Medline]. Golub D, Hu L, Dogra S, Torres J, Shapiro M. Spontaneous bilateral internal carotid and vertebral artery dissections with dominant-hemisphere circulation maintained by external carotid artery-ophthalmic artery anastomoses. Neurosurg Focus. 2019 Feb 1. 46(2):E6. [Medline]. Del Zotto E, Pezzini A. Use of fluoroquinolones and the risk of spontaneous cervical artery dissection. Eur J Neurol. 2019 Jan 29. [Medline]. Hakimi R, Sivakumar S. Imaging of carotid dissection. Curr Pain Headache Rep. 2019 Jan 19. 23(1):2. [Medline]. Kasprzak D, Bojakowski K, Nowicki M, Zawadzki M, Andziak P. False aneurysms complicating internal carotid artery dissection. Vasc Endovascular Surg. 2019 Jan 10. 1538574418823381. [Medline].